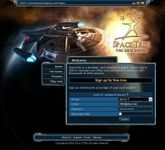 SpaceTrek is a strategy and roleplaying game, where you're able to manage your ships and colonies in a universe with thousands of other players. Interact with thousands of players in a lasting, futuristic world. Colonise planets, wage war or trade peacefully with your neighbours. "Account for life "- STNE plays for endless rounds, there is no reset (reboot). You can register at any time! An elaborate game concept ensures that you may get as good as the oldest players! Bashing (robbing) of beginners is a foreign word in STNE! You don't need to be online all the time and you don't have to fear that you might be attacked! Every planet, every building and every spaceship is seperate and interactive in many ways, thanks to a comprehensive micromanagement system! Due to the huge complexity of STNE you will never be bored! Playing time of 2-3 years are not uncommon.